I've never made Chelsea Buns before but was not daunted by the sweet dough after making the Kugelhopf which turned out so well. I'd also been watching the contestants on the 'Great British Bake Off' making sweet doughs the other week and it reminded me that I should make something like this again. 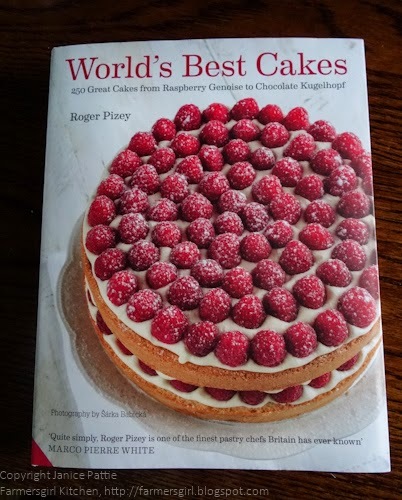 The opportunity came in the form of The World's Best Cakes by Roger Pizey, one of the finest pastry chef's in Britain, according to Marco Pierre White. Roger Pizey is a celebrated baker and patissier with over twenty five years experience at the cutting edge of cooking. He trained for two years with Albert Roux at Le Gavroche in London before joining the charismatic Marco Pierre White as his Chef Patissier. The World's Best Cakes is a collection of globally inspired classic bakes from national favourites such as American Boston Cream Pie and British Chelsea Buns to exquisite small treats including Russian Tea Cakes and French Madeleines. The book is a Masterclass in baking, regular readers will know that I own many baking books and, over the past year, I have reviewed quite a few books on cakes and baking. All I can say is GET THIS BOOK ON YOUR CHRISTMAS LIST. Roger Pizey takes you through all the Basic Techniques you will need. shown in step by step pictures. 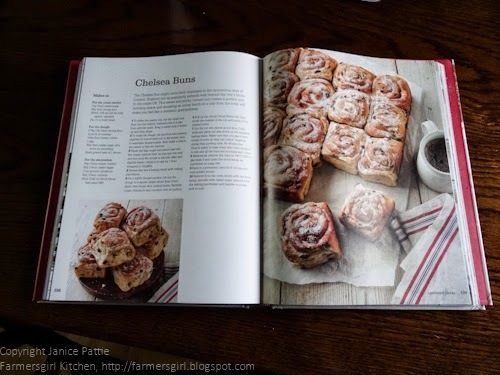 Every recipe is accompanied by stunning photographs, often two for each bake, the whole cake and a slice, or a variation e.g. Victoria Sponge and Fairy Cakes. The recipes themselves are clearly laid out with the ingredients and each instruction in the process clearly numbered. There is also a paragraph about the recipe and some recipes have variations too. Another feature of the book is the pages on 'Where to Eat Cake' in various cities around the world. For me, the standout recipes in this book were the Raspberry Angel Cake, Willie Harcourt-Cooze's Cloud Forest Chocolate Cake, Pastel de Chocolate Mexicano (A Chilli Chooclate cake), Espresso Marble Cake, Olive Oil Cake with Peaches, Richard Corrigan's More Stout Than Treacle Cake, Basbousa (a Semolina cake), Banana Cheesecake, Mustikkapiiraat (Finnish Blueberry Buns), Cinnamon Bear Claws and Christopher Farrugia's Maltese Prinjolata. Are you getting the picture? I could go on and on because every cake looks fantastic and fascinating and so, so delicious that I want to make them all. Well written recipes, beautiful pictures, lots of cakes I've never even heard of, let alone made, before. The step by step basic techniques is easy to follow and there is also a section at the end of the book called 'Baking Basics' which includes recipes for Creme Anglaise, Creme Patissiere Royal Icing, Chocolate Ganache etc. Not really a book for a beginner baker, the recipes are clear enough but there are many which demand more technique, fine if you have a little experience of baking and want to expand your repertoire. @FarmersgirlCook I bought the world's best cakes book as u said its gd. Wow. It is one of the best bks I have seen. Simply stunning. 1. To make the yeasty mix, stir the sugar and flour into the milk in a pan, then add the years. Keep it warm until it froths up and then drops. 2. To make the dough, sift the four and nutmeg together in a bowl then rub in the butter until it resembles breadcrumbs. Next make a well in the centre of this dry mixture. 3. Whisk the egg, sugar and lemon zest into the yeasty mixture then tip this into the well and mix until the dough is smooth, silky and slightly elastic. Allow it to rest for 1 hour wrapped in clingfilm. 4. Grease and line a baking sheet with baking parchment. 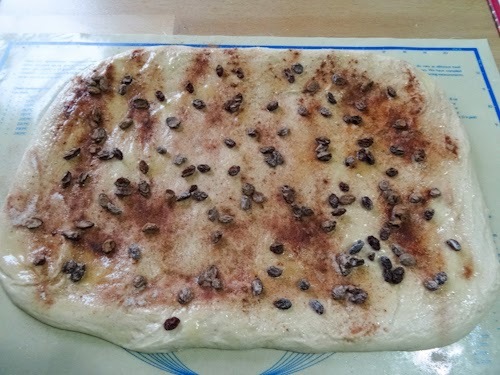 5. on a lightly floured surface roll out the dough to a square shape about 4 cm (1 1/2 in) thick, then brush with melted butter, Sprinkle sugar, cinnamon and currants over the surface. 6. Roll up the dough (think swiss roll), then brush the outside of the roll with more of the melted butter. 7. Cut the roll into pieces about 4cm (1 1/2in) wide and place cut side down on the prepared baking sheet. Make sure that you place them evenly in rows so they can batch together during their proving time, 45-60 minutes. They are ready to bake when they have doubled in size. and all the buns are touching each other. 8. Meanwhile pre-heat the oven to 190C/375F/Gas 5 and make the stock syrup by placing the water and sugar in a pan until the liquid becomes syrupy. Pass through a sieve then remove from the heat and leave to cool. 9. Bake in a preheated oven for 8-12 minutes until golden brown. 10. Remove from the oven, brush with the stock syrup, sprinkle with caster sugar, remove from the baking parchment and transfer to a wire rack to cool. Of course, I cheated! I didn't have any fresh yeast, so used Fast Action Yeast, put all the dough ingredients and the starter ingredients, substituting the dried for fresh yeast, into the bread maker and put it onto the dough programme. You could use your stand mixer with a dough hook, or just place it all in a bowl and mix by hand. The dough still came out silky smooth and the buns were well risen and tasted great. I'm entering these Chelsea Buns for Tea Time Treats, the blog challenge run by Karen at Lavender and Lovage and Kate at What Kate Baked. 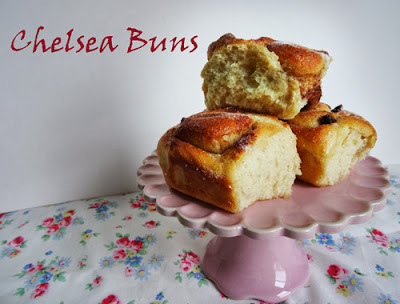 The theme this month is Sweet Breads and Yeast Breads, so my Chelsea Buns fit perfectly and, believe me, they are a treat! Quite a marathon bake Janice. 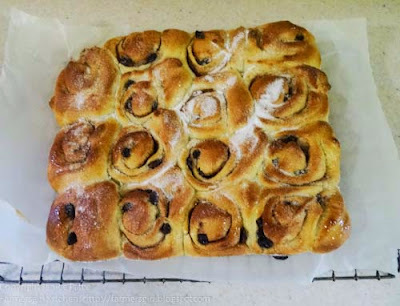 I remember when I made my marmalade sticky buns that this type of bake takes ages! But they are worth it - they were very delicious I'm sure! 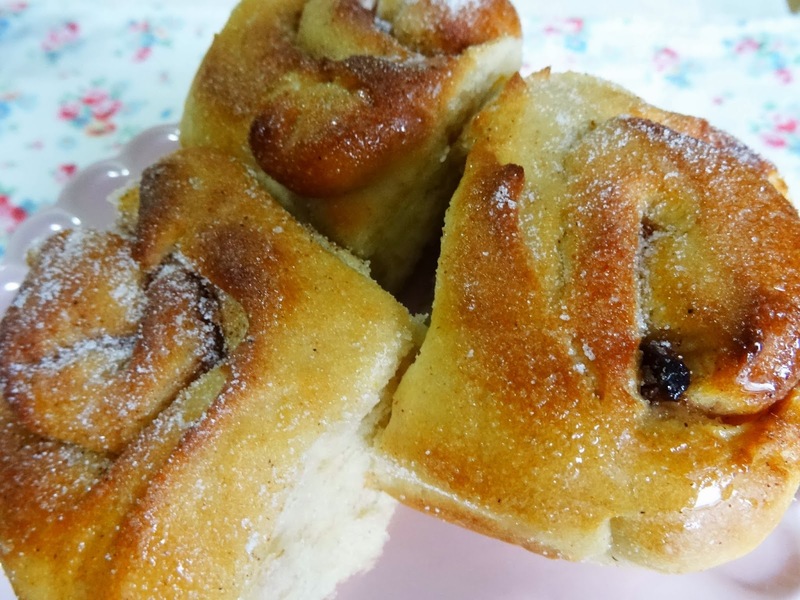 These rolls look similar to those we have in Trentino, with cinnamon and spices. I never tried both recipes, but during winter I'll surely try! They look so yummy!! :-) Thanx for sharing! Glad you all like the review and the buns! Stuart- I remember your marmalade buns they looked great. Dom - Plenty to challenge you in this book. Simona - I'm sure every country has something similar, it's really worth making them, they taste much better than bought. Choclette - there are some excellent chocolate recipes in there too! Wow, these look amazing. 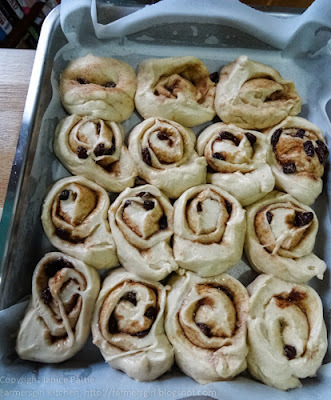 I've only ever made Chelsea Buns once at school and just remember that they were a lot of work - or maybe I was just lazy LOL:-) Fab work!